Has it really been almost a month since Homecoming weekend? Well, as we all start to gear up for the big rivalry game this weekend, I would like you to meet Clemson's Homecoming Queen Ashley Martin. She was kind enough to let us interview her so our readers could meet the real Clemson Girl behind the crown. You'll find from her responses that she's super sweet and humble, easy-going, involved in the community, smart and classy - the perfect representation of a Clemson Girl and the right girl to represent us as Homecoming Queen. Clemson Homecoming court - Ashley is in the middle, wearing the crown. 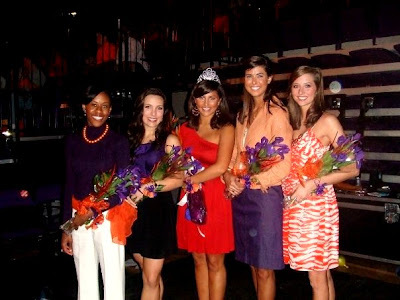 What made you want to run for Clemson Homecoming queen? I wanted to run for Miss Homecoming because I felt like it would be a great way to make my mark on Clemson's campus and be a part of a huge tradition at this University. I felt like I would represent my University well and only hoped that the judges and the student body felt the same. It was such a great experience and it will forever be one of my most cherished moments in my college career at Clemson University. The overall experience of being in the pageant was amazing! The directors Jesse Winchester and Merry Mac Miller put so much hard work into the production. I wasn't really nervous because all of the girls were so nice and everyone felt really comfortable with one another, which made the pageant so much fun! What was the first thought in your head when you found out you were the winner? My first thought was......"This can't be happening!" Then I was just in pure shock! I could hear my roommates cheering me on from the stands..."I live with her!" I couldn't help but laugh! I will never forget that moment for the rest of my life. I was so honored to be chosen by the student body of Clemson University. What made you decide to go to Clemson after high school? I decided to go to Clemson University after I toured the campus my senior year in high school. I had already applied to a few schools and wasn't really sure where I wanted to end up. After touring the Clemson campus I was sold. The beautiful landscape, the strong sense of pride, the high achievement in academics and the friendly atmosphere reeled me in instantly. It was by far one of the best decisions I've ever made! What is your favorite thing about being a student at Clemson University? To tell you the truth I can't really pin point my favorite thing about being a student at Clemson University. It could be the feeling I get when the football team runs down the hill for the most exciting 25 seconds in football, or it could be the fact that when I walk around campus any given Friday I will be immersed in a sea of orange. Or maybe my favorite thing about being a Clemson student is all of the opportunities I've been given to get involved, study abroad, or work for the University. It is hard to truly decide what my favorite thing is, but what I do know is that I am so thankful to be a student at Clemson University. After graduating from Clemson, I plan to attend the graduate program at the Medical University of South Carolina and gain a Master’s in Health Administration. MUSC writes in their mission statement that they are committed to educate their students to become caring, compassionate, ethical, and proficient health care professionals. In my own life mission I hope to also be caring, compassionate, ethical and proficient with my family, friends and community. I feel that the education I gain at MUSC will not only prepare me for my future career as a health care administer, but it will also give me the knowledge and experience to live a successful life. My favorite gameday outfit would be that perfect orange dress with a purple scarf and cute boots. Accessories are also a must, but the number one thing to top off the outfit is the tiger paw tattoo! Nothing says Clemson pride like a tiger paw tattoo on your face! What's your favorite tailgate snack/food? My favorite tailgate snack is chicken enchilada dip, absolutely love it! My mom has the best recipe! My favorite sport to watch is football! I grew up on the sidelines cheering for my middle school and high school football team so I love watching it! But of course it is ten times more fun watching a football team you know! Go Tigers! My favorite TV show is “So You Think You Can Dance.” I have been a dancer all my life and I love watching these young men and women who have so much passion and drive because it inspires me to never give up. My favorite color would have to be turquoise! It is one of my ZTA’s signature colors and I have always loved it. What is your favorite place to eat at in Clemson? My favorite place to eat in Clemson would have to be Calhoun Corners. The night I was crowned Miss Homecoming Queen my family and I ate at Calhoun Corners and had a fabulous dinner. My favorite dish there is the shrimp pasta. My favorite clothing store is McCauley’s Unique Boutique! I love all the girls who work there. They helped me find the perfect outfit for Tigerama, which so happened to be the night I was crowned. They have the cutest outfits and the best customer service. Whenever I am looking for a cute outfit for a special occasion I go there first. If you could have lunch with anyone, alive or passed, who would it be and why? If I could have lunch with anyone alive or passed I would want to have lunch with Erin Andrews. She was a Zeta at Florida State and she is now a very successful sports caster. She seems very driven and I would love to see how she broke into the world of sports news casting. My favorite holiday would have to be Christmas! Every year around this time I get so excited to start decorating for Christmas. Everything and everyone during this holiday is bright and festive! I love celebrating the traditions with my family and hearing the true story of why we celebrate Christmas at midnight mass. Of the three songs, which is your favorite? Tiger Rag, Clemson Alma Mater, Eye of the Tiger. I would definitely say that the Tiger Rag is my favorite. It is the song that gets me going! Every time I hear it I can't help but start clapping and bouncing. When the announcer at half time introduces the band and the song it makes me smile! "And now, the song, that shakes the southland.....Tiger....Rag!" For any Clemson Girl who's reading this who is thinking about running for Clemson's Homecoming Queen next year, what advice would you have for them? If you are thinking about running for Clemson Homecoming Queen there are a few simple pieces of advice I would give you. First off always be yourself throughout the whole process. The judges will appreciate your sincerity and it will make the interview a lot smoother. Also be prepared by getting your paperwork in and having your outfits ready for the pageant. And last but not least, don't sweat the small stuff and have fun! I totally messed up my opening number walk and ended up forgetting to cross the stage. All I could do was laugh it off backstage with the rest of the girls! Don't forget no matter what the outcome, it is all about the experience and what you can take from it.